RISE and FALL - The countdown to cancellation. Really? I thought the 2012 series was mostly great. It did have a few missed but even the 87 and 03 series had their misses. I'm not really sure what to make of the rise series yet. It's definitely my least animated series so far but it is still a little bit fun. In IDW EVERY FAN OF THIS FRANCHISE should trust. It’s the definitive version. Is it really? I mean from the little I've read of IDW, it's well done in some areas but I personally feel it has it's own problems. I respect it for what it is so far, though. IDW's only real problems are the pacing issues, as it can take months and even YEARS for plotlines to be touched upon. However if you're marathoning the book and reading the collections, obviously that's not a problem. It just takes a long time for stuff to happen, especially since they always introduce characters or plotlines early and don't get back to them for months or even years later. Besides that some of the artists take on the Turtles could be hit or miss, but I like at least 80% of the art in the IDW books. I don't think I will watch this. Poor Leo was demoted to be the cool brother. That should be appointed to Mikey or Mikey will be the silly one again?. At least, the drawings seems better than the infamous Thundercats Roar's ones. A ridiculous pantomime of the beloved 1985 original series. Yeah, it just stinks because I don't find this version of Leo funny. I feel that he's too try-hard and his brothers (even Mikey) never get a good laugh from him. The guy even dabs, for God's sake! If he can let falling on Raph's champion count as becoming the new champion go to his head, imagine how he'd act like if he were to win the Battle Nexus. The guy even dabs, for God's sake! Oh god, is that what that was? I saw that move, thought Oh please no, just stop, but never connected that "dabs" word to it. This show is going to age so badly. Has Leo gotten punched yet? That was awful. Just... badly-written, badly-conceived, bad all around. Ugh, this is so disappointing. Yooooooooooooooooooooooooo that was way too sick. Mad good. Maaaaad good. You can't even contribute anything worth a damn to threads you create. Well, Meat Sweats slugged him in the head in "Donnie's Gifts," and stopped him mid "one liner," so yes. 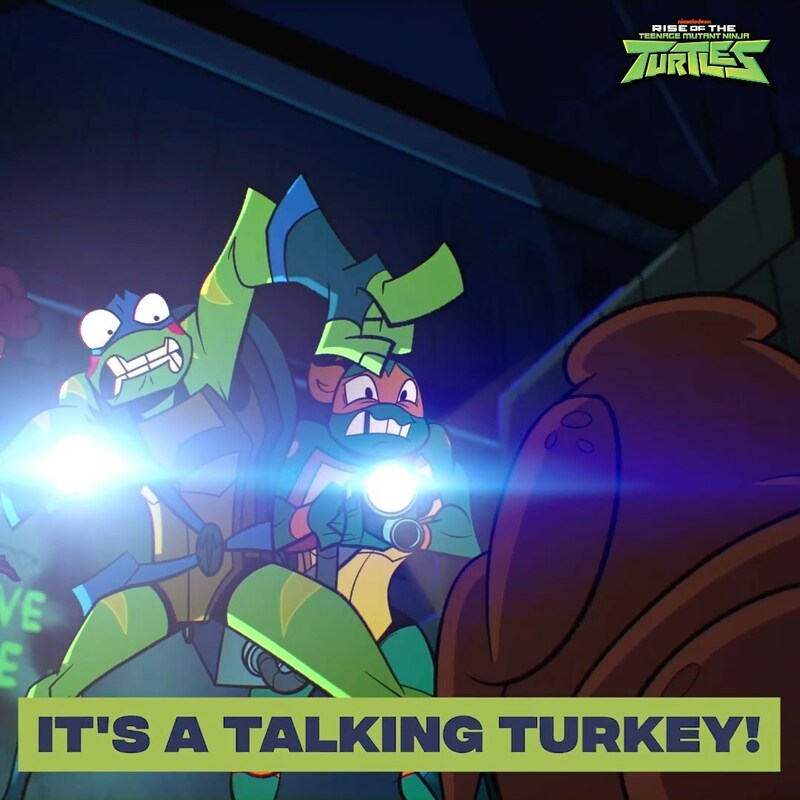 Whats's wrong with it, it's a possessed turkey in a haunted supermarket. Did you watch the promo. You do know that's from tomorrow's episode right called The Gumbus, April, Mikey and Leo investigate a haunted supermarket. Cancelation can happen after the end of season 2 if it is still only mutants and not me , my henchmen, utroms , triceratons, stockman e.t.c like it was most episodes of 3 previous series. If Teen Titans Go has made it past 5 seasons, then I can see this easily making it that far. Rise’s tie in comic is selling very poorly. Yeah but so did the last cartoon tie-in book. And it doesn't really have much impact on the show itself. As I understand it, comics don't count as merch the same way toys or video games do, more like promotion. The new show and, as someone said here earlier, the new Thundercats are absolute travesties for the properties. Hopefully when the don't do so hot, the producers won't follow in Marvel's footsteps by blaming the fans for "trying something new", which in fact is a cliche. And aside from the poor character beats, modern flash-style animation is absolutely an awful trend. I say "flash-style" animation because I don't know what else to call it - that animation style we see on the new show, on Teen Titans, and other cartoon that as a kid I would'v thought was meant for4 year olds only. Rise of the TMNT definitely has better animation than "flash animation" the show actually looks very good in motion and the action scenes. Yeah, even though it’s animated digitally, it’s still hand drawn which is better than most shows nowadays. This is also inexcusable because it has been a few years since PPG 2016, Ben 10 2016, and Sonic Boom all flopped. I know they're desperately trying to do it right with this show, but they scared the audience away already with their artwork and the fact it was lighter (and hence followed a trend). Overall this show is advertised as closer to Ultimate Spider-Man (which was still an unpopular show) than TTG and its clones, but Ultimate Spider-Man died off a few years back and the immediately subsequent show isn't any better. This is a tainted concept. Come back in about 5 years on MTV with a direct IDW adaptation and then we'll talk.